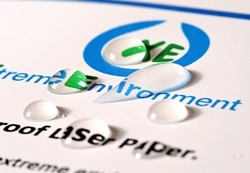 XE Desktop Waterproof Laser Paper/Card is optimised for use on desktop laser and LED printers as well as mid to low speed colour copiers and other smaller toner fusion devices. It has been rigorously tested to deliver quality output on short to medium print runs. With specifically tuned electrical charge characteristics to enable vibrant imaging and minimise static related feed problems, XE Desktop has an ultra smooth finish which ensures easy feeding on desktop machines. A5 sheets combine the look and performance of paper with the added strength and robustness of a polyester film. Ultra-tough waterproof A5 paper and card ideal for prolonged use in a wide range of Xtreme Environments where durability against exposure to the elements; handling or cleaning is critical. Waterproof - impervious to freshwater, saltwater, rain and even treated swimming pools! Alternatively, for optimised printing on high speed (60ppm+) dry toner colour digital presses and production colour laser printers choose XE DIGITAL WATERPROOF LASER PAPER AND CARD - A5 sizes. Waterproof, greaseproof, tearproof, chemical resistant, wipeable and punchable. Delivering all the benefits of the XE range but manufactured using 85% industrial/manufacturing off-cuts. Optimised for desktop printers.